Sure, I haven’t even turned it on in more than 5 years, and I certainly didn’t use it very much back then either. Its been sitting in the bottom of the storage closet doing no one any good, yet it pains me just a bit to let it go. 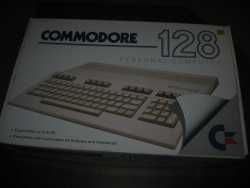 The Commodore 128 was a gift to me from a lawyer who also hadn’t used it in years, but used it as a high-end word processor, as the backspace keys on typewriters left a tell-tale sign that you had definitely erased something (and with a pocketknife, you could probably tell what). It wasn’t my first Commodore, though. I got a secondhand Vic-20 when I was about 8. It came with a manual that was little more than a “How to program basic” with some sample code to write some simple games, and some atari-like cartridges with games like “space invaders”, and “adventure”. I was a big fan of the text-based games. I later ended up tearing it apart to check out its innards, and left it broken for too long that circuit boards and small parts went missing. I remember getting in trouble for “hacking” in school the first time we were taken to the new computer lab equipped with early apple’s running basic, and I had instructed the computer to run an infinite loop of the below program I had learned from my trusty Commodore manual. I had a friend whose father was an avid computer geek in these mid-to-late 80’s days, who would pirate video games by tuning his ham-radio to a station that broadcast the analog signal he could tape onto a cassette he could read back into the computer. I don’t know if I’m reminiscing, or just trying to hold on to the memory of the way things were because they were so drastically different from today. The information economy and the internet as we know it has forever changed the way we work, play, and live. Anyhow, I’ll miss the Commodore all the same; but I’m happy it found a new home, freed up some of my closet space, and helped me put down the deposit on my new apartment.